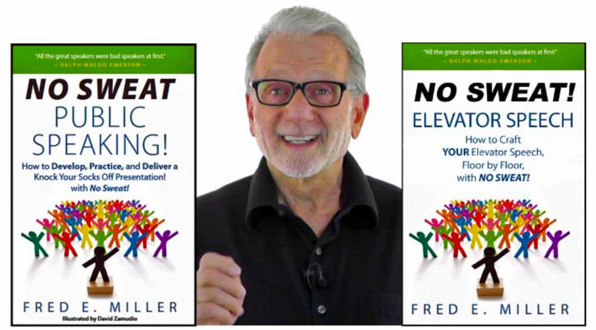 Mastering you Elevator Speech: Speaker and coach Fred Miller shares his nuggets of wisdom on how to deliver the most effective elevator speech to take your business to the next level and how to make your Elevator Speech - NO SWEAT! Home | Speaking/Presenting | “Mastering Your Elevator Speech” Interview. 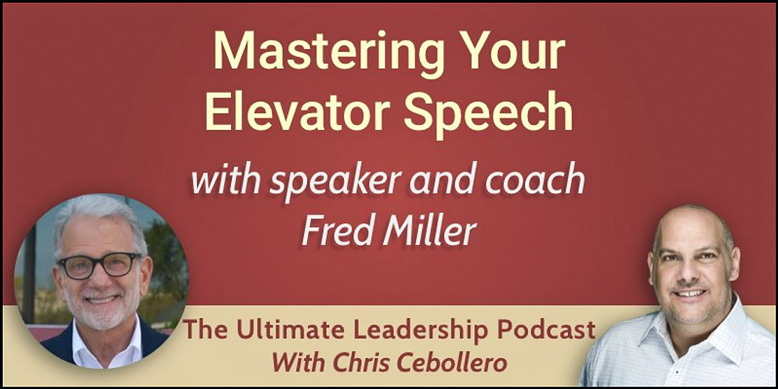 Speaker and coach Fred Miller shares his nuggets of wisdom on how to deliver the most effective elevator speech to take your business to the next level. Please listen to the entire interview. Chris Cebollero is the consummate podcast host and interviewer. The highlights are below. How to Develop, Practice, and Deliver a ‘Knock Your Socks Off!’ Presentation with – NO SWEAT! How to Craft YOUR Elevator Speech, Floor by Floor, with NO SWEAT! Follow these suggestions for crafting and delivering your Elevator Speech and I guarantee, it will be absolutely, positively – NO SWEAT! Here's a FREE EXPRESS Elevator Speech. . .